The Keshet Yehuda Pre-Military Academy celebrated its annual "aliyah party" for young men who are beginning a new chapter in Israel. There is nothing like a good party, especially when celebrating the return of more Jews to their ancestral homeland. The Keshet Yehuda Pre-Military Academy recently celebrated its annual “Aliyah Party” for a small group of young men who are passing on the status quo of coming to Israel for a one-year “Israel Experience.” These soon to be lone soldiers have left their homes, family and friends to begin a new chapter in their lives in Israel. They have plans of serving in combat units, and many have their eyes set on the Special Forces. 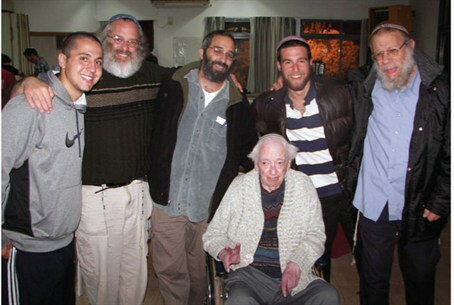 What makes these young men so remarkable is that they decided on their own to make Aliyah after high school. Keshet Yehuda is a religious Zionist pre-military academy which was established in 1991 on the Golan Heights as one of the first such institutes in Israel. Today it is one of leading academies in Israel. It prepares religious boys for their military service by strengthening the base of their religious observance, thus instilling in them a deeper and more profound understanding of what they are fighting for. The aim is to educate the boys to become highly-motivated soldiers and officers serving both in the ranks and in special units, as well as to give them a strong moral and ethical base upon which to make difficult decisions when required. The academy’s goal is to bring up a generation of potential leaders of society. Keshet Yehuda has enabled nearly 2,000 young men to become leaders in all fields of Israeli society. Within the academy is the integration program which absorbs overseas boys directly into the Israeli student body. This helps the young men overcome the common difficulties of being new to Israel, such as language and mentality. The continuous social contact not only teaches them Hebrew but also builds for them a solid social framework in Israel. The program includes Limudei Kodesh and activities to strengthen their connection with Israel and help with the army. There is also an adoption program for lone students. Students always have a place for Shabbat and holidays. This program provides a solid foundation for a young man who has made Aliyah or is considering it. “The leadership at Keshet Yehuda recognized the need to create a Torah based integration program for young men coming to Israel after high school,” Rabbi Cohen said, explaining how the program was formed. Keshet Yehuda’s challenge is to let more young men know about the program. Most of them learn about the program from word of mouth, links on sites like Nefesh B’Nefesh, or from surfing the Internet. For more information about the program, please visit http://www.aliyah18.org and http://joingtheisraeliarmy.org, or contact Avraham Venismach av@keshetyehuda.org. Avraham Venismach is the Marketing Director of the Keshet Yehuda Pre-Military Academy Aliyah & Integration program.